By Sophie Leininger ’18, political science and psychological science major and Gustavus Women’s Soccer player. At U.S. Bank Stadium on a Sunday morning in autumn, there are three hours until kick-off and less time than that before Gustavus Adolphus College alumnus Mike Wobschall ‘06 needs to be in the radio booth overseeing the football field below. 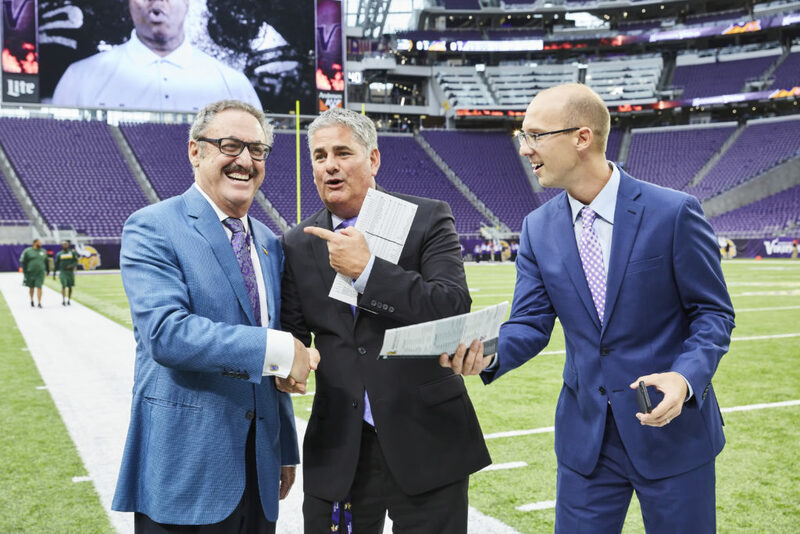 As fans fill in and the excitement grows, he joins Minnesota Vikings play-by-play announcer Paul Allen on the sidelines and the two move in front of the camera to film the weekly pregame show, Vikings Gameday Live. Wobschall records one more live radio spot before he settles into the role where it all began, next to the broadcasters and the sports statisticians. 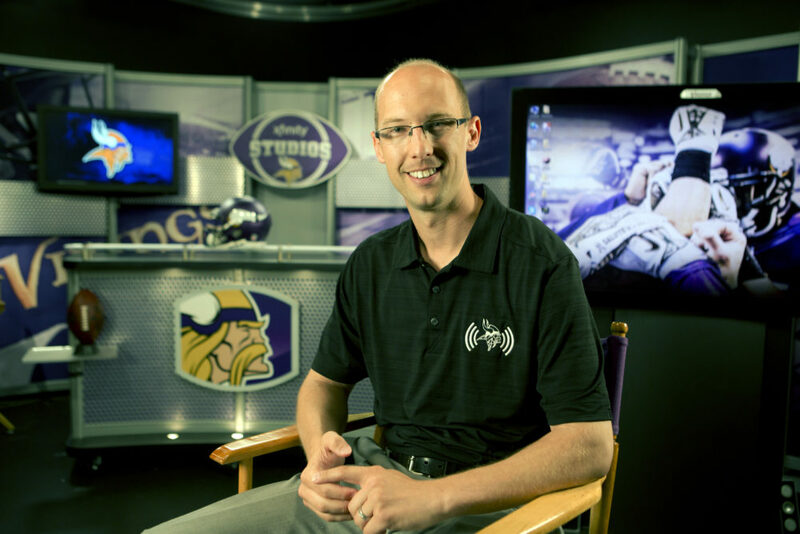 The former student employee in the Gustavus Department of Sports Information is now the Senior Content Manager for the Vikings Entertainment Network, where Minnesota football fans and followers know him as “Wobby,” their one-stop connection to all things Vikings. Behind the scenes, Wobschall helps manage several of the organization’s digital content platforms, including the website and both radio and television programming, while also acting as an intermediary between these departments. But to Wobschall, a loyal fan who used to cheer from his hometown of Waseca, Minn., the most important part of his job is interacting with the fans and allowing them to see their favorite team in a different light. Wobschall answers every fan email and responds to select questions through weekly articles and video series known as the “Monday Morning Mailbag” and “Pick 6 Mailbag.” While posting updates on social media and articles on the website, he also provides team reports and player analyses on his podcasts. He is a regular contributor on KFAN Radio with Allen, who is both a colleague and close friend. For Wobschall, finding his home as an integral part of the Vikings media team was the final step after a successful and busy four years at Gustavus. During his time on the Hill, the communication studies major and political science minor gained an appreciation for working towards a larger goal. Outside of the classroom, Wobschall found an influential mentor in Tim Kennedy ‘82, the College’s former sports information director and current vice president for marketing and communication. Kennedy organized the sports information office with the purpose of producing professional work while also putting his student assistants in direct hands-on roles. Wobschall fit right into the team, excelling in the press box and quickly learning the ropes of sports statistics and reporting. Wobschall’s hard work did not go unnoticed. During his sophomore year, he was offered an internship with the Minnesota State High School League, where he kept statistics for state championship games. Within the next year, Kennedy recognized that Wobschall could perform at the highest level and made a phone call to Tom West, the Minnesota Vikings’ assistant director of public relations. During his senior year and the 2005 Vikings season, Wobschall joined a media relations team of three personnel and wrote articles for the official Minnesota Vikings website. After graduation, the Vikings offered him another internship, which turned into a full-time job in 2007. 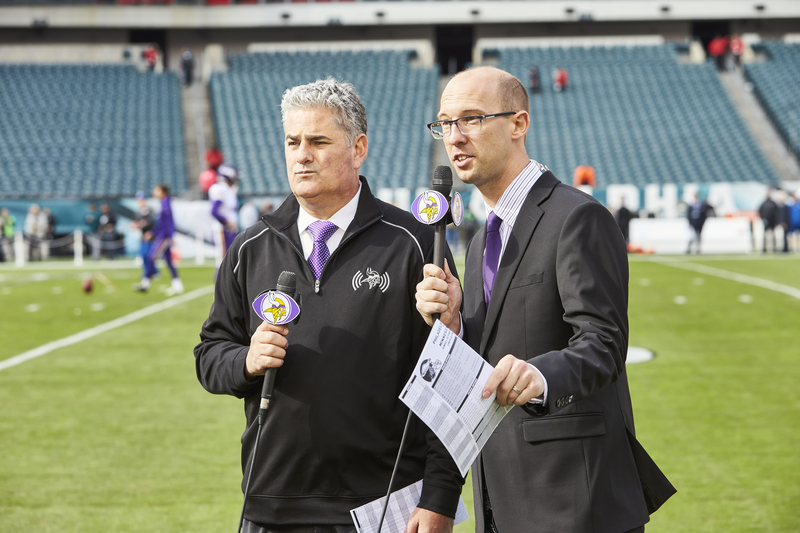 Since then, the Vikings Entertainment Network has grown with the rise of technology, adding nearly 20 more employees and a presence across all media outlets. An image from the Sept. 25, 2016 regular season away game against the Carolina Panthers. The Vikings won 22-10. Looking ahead, Wobschall is excited for the future. When the team and network transitions to the new facility in Eagan in the upcoming months, he hopes they can continue to push the bar in their industry and unveil new content on more mediums. In the meantime, he is content splitting his time at the current Vikings office at Winter Park with his home in Loretto, Minn., where he and his wife Ali (Chorley ‘08) are raising three young children. The kids are frequent visitors to the Vikings training camp and office parties — and their dad is showing them how to wear Gustie black and gold and Vikings purple all at the same time. This is a wonderful story. I was pleased to see Ali Chorley ’08 is Mike’s wife. She is an Orono High School graduate. Ali and Wobby have been favorites of mine since I started working at Gustavus. I continue to have interactions with them and look forward to many more years of their friendship. They are a prime example of why I love my job and continually get to see how Gustie Graduates “Make Their Life Count.” Skol Vikings, Let’s Go! !